Man I love this series. It is just so raw and original. The writing is marvelous, the characters are just wonderful and the stories…well they’ll just drag you to the edge of your seat and won’t let you settle until you reach the very end of the book. 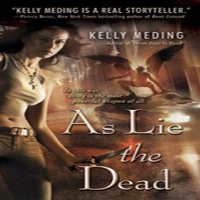 Another Kind of Dead, book three in Kelly Meding’s Dreg City series, starts off a little over a week after the end of book two. Evy is thought dead (again) and she and Wyatt are hoping to keep it that way. Unfortunately, evil crazy-dudes and creepy as hell mutants seem to have other plans and once again Evy is having to choose between what she would love and what is right. Wyatt is such a sweet man! I always liked him, but I like him even more now! Who knew he had the potential to be such a wonderful sort of-romantic lead?! My heart ripped out when reading about what he was dealing with again. Another testament to the writing in this series. One of my favorite parts of this book (and of the other books too) are the flash back chapters. They really help you to understand where everything started and they are placed in such a way that you don’t get confused or lost in the current story while reading them. Really cool. And speaking of flashing back, these books really are not stand alones…at all. 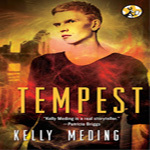 But if you are like me and read book two when it came out and remember most but not all of what happened, Kelly does a wonderful job recapping the previous books. But she does it throughout the whole book! So you are not sitting there reading chapter upon chapter of “Previously in Dreg City”. I was really impressed by that. Geez…can you tell I really enjoyed this book?! The beginning of the books was solid, but it’s really at the 30% or so mark where it really grips you in and doesn’t let you go. And I am going to give you guys a heads up and say that this series is not for the faint of heart. Kelly has a pretty twisted visual imagination and is very good at sharing and describing what is going on in that head of hers. Meaning: These books are quite graphic – and often gory. Not that the gore is simply placed there to make you squirm – it is all part of the story and it’s there to paint a clear picture of what Evy and her friends deal with. What her world is made of. This is not a light and fluffy UF series: It’s the read deal. 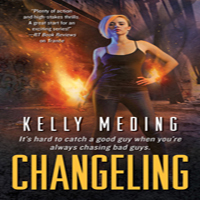 I mentioned at the beginning of this review that the plot lines in this series will drag you to the edge of your seat and won’t let you settle until you reach the very end of the book. That is very true for each and every installment to date. When you finally reach The End, you fall back and finally release that breath you didn’t realise you were holding…only to bring yourself to the edge of your seat again once you start contemplating what is going to happen next. That sensation I get at the end of each book was even stronger this time around because, even though you knew Evy’s story would continue in future books, this time around there is a clearer direction as to where the story is headed. The über bad guy is on the loose and Evy is his muse of sorts. You just know he is going to be looking for her. And man I can’t wait to see what happens when he does. 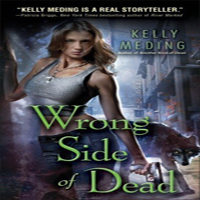 Share the post "Review: Another Kind of Dead by Kelly Meding (Dreg City #3)"
Julie, Great review! I love this series and can’t wait to read it. So please add this book to pile of books I’m gonna steal at night, the question is which night? blodeuedd – One day try it, but this is true UF. A little harsher compared to what’s out there sometimes. Sounds like such an awesome series Julie! 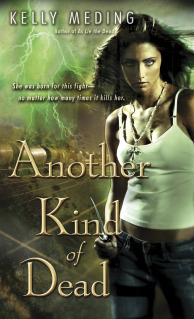 Great review and I really need to make sure this series is on my TBR shelf!